This apartment is situated in a nice and centrally located complex with pool.West end of Puerto del Carmen, ten minutes walk from fishing harbour and sandy resort beaches. Two minutes walk from shops, bars and restaurants, five minutes from Biosphere shopping Mall. Sleeps four.The apartment is spacious, comfortable and stylishly furnished. It consists of two twin bedroom, one of them is very nicely decorated for children with a bunk bed. A cot can be supplied at no extra cost . The living room includes satellite TV with International channels and DVD. The kitchen is fully equipped and has all the usual facilities including oven, hob, microwave oven, fridge, toaster, electric kettle, iron and ironing board. There is also washing machine for guests to use. All linen is supplied with a change of towels weekly. Outside sees a large terrace area, ideal for sunbathing, plus the property has a small balcony. We have been going to this apartment for the last five years. It has good facilities and is very clean, comfortable and well maintained It is in a very quiet and peacefull area. The owner Teresa is always available should anything be required, she offers good customer service. For us as an elderly couple the location of the apartment is excellent, with a supermarket and several bars and restaurants on the door step. Everything you require is within walking distance. 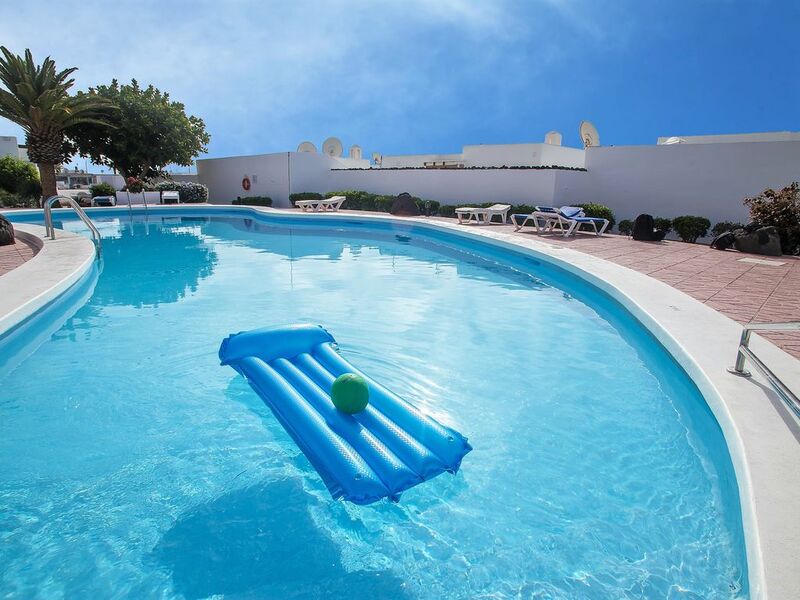 There is access to a lovely sheltered private pool with sun loungers just across the road from the apartment. We have booked to return in 2011. We would not hesitate in recommending this apartment for a lovely quiet relaxing holiday. Excellent accueil, bien situé et d'une grande propreté. Teresa sait accueillir ces hôtes avec convivialité et chaleur. La maison est agréable et bien située, il n'y a pas de problème pour se garer à proximité.Une femme de ménage vient dans la semaine ce qui garantit un bon entretien . Le seul petit bémol tient à la configuration de la deuxième chambre qui donne dans le salon . Nous vous remercions d’avoir pris le temps de poster un avis si élogieux suite à votre récent séjour parmi nous. Nous espérons avoir l’occasion de vous accueillir très prochainement de retour au Lanzarote, et dans cette attente, nous vous prions d’agréer, Cher Client, nos salutations les meilleures. La ringraziomo molto per il tempo prezioso che ci ha dedicato nel scrivere il suo feedback: è sempre un motivo di orgoglio per tutti noi quando un ospite ci porta a conoscenza della sua esperienza, permettendoci cosi di migliorare la qualità dei nostri servizi. très bel appartement, superbe piscine au calme. Propriétaire très professionnelle et accueillante, très disponible. A recommander. Parfait séjour. Je tiens à vous remercier pour votre commentaire très positif. Je suis ravi de lire que notre appartement ont contribué à vous permettre de passer un excellent séjour à Lanzarote. Nous espérons pouvoir vous accueillir de nouveau prochainement. About 15 minutes drive from Arrecife airport, Puerto del Carmen offers 5km of broad, pale sandy beaches as well as a wide variety of places to eat and drink and it remains a popular destination for holidaymakers from far and wide. Made up of a ‘new’ and ‘old’ town, Puerto del Carmen has no high-rise structures and almost all buildings are white and unpretentious. In the evenings you can watch the locals taking part in a few games of boules in the old town, which seems to be a nightly occurrence. The old town also offers a great variety of restaurants serving fresh fish, while if you head off into the holiday area you'll find everything from traditional English sports bars to Chinese restaurants. Additional info about MONTAÑA COLORADA C.B.